They are sometimes called "wildlife feeders" or "game feeders" and are usually used for deer hunting. In our case, I'm using a deer feeder to entice the Mule Deer back because I just don't feel that the environment is healthy without an occasional deer browsing near by. For me, deer are a "bio-indicator". The photo below is the current condition of the area where we'll be adding the feed pedestal. We didn't want one of those ugly metal mechanical feed spreaders that runs on a battery and throws feed out into the dirt. We went with the Hurley-Byrd Bird Feeder Co. that specializes in handcrafted oak wildlife feeders. Ours is a 3' free standing oak trough that will be stocked with 20 lbs of cracked corn, apples, oats, acorns and a salt lick. This may take a while. Probably the best encouragement would be to focus on getting Catherine's orchard replanted and making sure the raspberry plant has fruit. When it comes to deer, if you plant it, they will come. I've been browsing the internet and boy they have a lot of products that are supposed to attract deer. Deer calls, chemical attractants, everything but hypnosis. Maybe it's too late but I'm trying not to be too undignified in this endeavor. Spraying female deer urine just might be over the top. 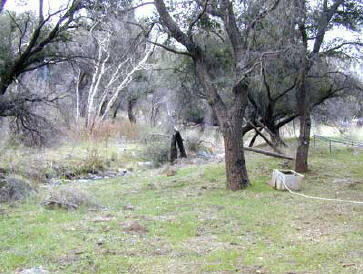 I may be fighting a losing battle and to be honest, if I were a deer, I'm not sure I'd feel comfortable on our ranch. Much of the undergrowth was burned off in the Cedar Fire and finding secluded cover is difficult. We also have a fickle water supply that can be here one day and gone the next. Lush green grass is seasonal and much of the year the area is parched and brown. On the other hand, the Mule Deer that inhabit our area are adaptable to harsh environments and are known to live in sparsely vegetated, steep rough canyons. That would be us so I'm making an effort to tip the scale in our favor. The need for replanting and encouraging native growth is a forgone conclusion and you can read about that in other areas of this site. Here I'm focusing on a deer feeder and watering station that will supply a consistent supply of food. This is the area where deer were last seen before the fire. The spot is next to King Creek though the creek's importance is more as a wildlife corridor than water source. Because it is a seasonal creek, I needed a spot that is close to a plumbed water source and I'll need to keep a water trough consistently full. The spot is open on the west side to a fenced in pasture and to the east is the creek with oaks, sycamores and recovering undergrowth. It's not ideal but it doesn't receive a lot of foot traffic and it's reasonably quiet.